Florida is home to over 11 million dogs. Who doesn’t love a furry friend to play Frisbee with on a sunny day? These lovable critters bring warmth and purpose to many a Florida household. Sadly, sometimes our furry friends become aggressive and hurt people. If you or a loved one encounters an aggressive animal, you may benefit from the counsel of an experienced personal injury attorney. Possessiveness: When a dog senses that his “property” is threatened, it may take steps to protect it. Dog toys, food, territory, or its human may be perceived to be under threat, prompting possessive behavior. Dog trainers suggest teaching a “Leave it” command to help dogs understand when to back off. Additionally, training dogs to wait for their food helps them to understand the importance of waiting. Because one can never be certain of a particular dog’s training, it is best to avoid actions that may be perceived as coming between a dog and its food, toys, or human. Furthermore, be careful to respect a dog’s territory. Fear: Dogs do experience fear, especially at the vet’s office or in unfamiliar situations. Be careful to avoid approaching dogs you don’t know, or dogs that are sleeping. If a dog seems fearful, back away. Pain: When an animal is in pain, it may become aggressive. Just as humans become ill-humored when experiencing a headache or other ailment, dogs may snap due to chronic aches or painful areas. Always avoid dogs that are injured or in pain. Maternal Instincts: Like all mothers, dogs have a protective instinct when it comes to their pups. It is important to use caution when handling puppies in the presence of their mother. Prey: Many dogs are ignited to chase when joggers or cyclists enter the scene. Their instinct to pursue “prey” can be diminished by stopping and standing tall. But beware of direct eye contact, as it can be interpreted as a challenge. Remaining calm in the face of a barking dog will not be easy, but is recommended by experts. In the event that you do suffer a dog bite, what recourse do you have? 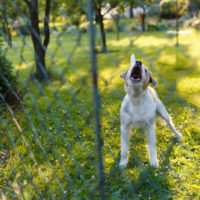 Dog bites are far too common in the United States, topping 4.7 million per annum, with nearly one fifth requiring emergency medical attention. Over half of these bites involve children, and roughly 20 percent of victims are elderly adults. In Florida, roughly 500 dog bites require hospitalization, and there are two dog-bite related fatalities each year. These are alarming statistics. If you or a loved one has experienced the physical and emotional trauma associated with a dog bite, the aggressive team at the Law Offices of Robert W. Elton in Daytona Beach, Ormond Beach and Port Orange can help. Contact us today for a free, confidential consultation.